The Parker 50 Falcon was released in 1978 with a sleek futuristic design which had the "unitary" nib incorporated into the body of the pen, very similar to an earlier design that Parker had released in 1970 called the T1 Pen which was made from Titanium and shared the same sleek all in one nib. Production of the T1 only lasted a year as production costs were so high and the difficulties involved with working with Titanium at the time meant that the T1 was sold at a loss. Parker learned from their mistakes and produced the Falcon in steel with fixed nibs in Broad, Medium and Fine incorporated into the body shell of the pen with a sleek narrow body and a plain but sleek arrow clip. 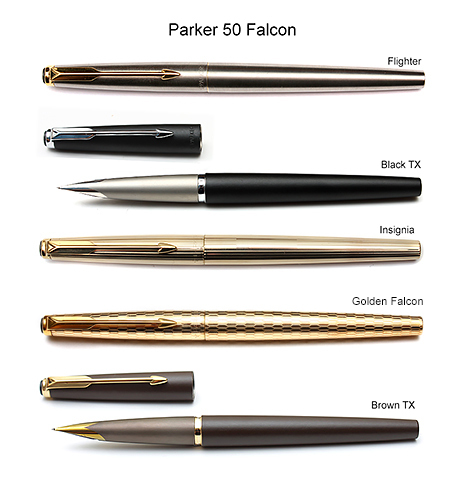 Initially, in 1978 when it was first offered, the Parker 50 Falcon was released as a Steel Flighter, but by 1980 a Black TX (also known as the Parker 50B) version with a matt black epoxy body appeared on the catalogue followed in 1981 by a gold filled Signet (or Insignia) and finally in 1982 a Brown TX completed the line. The Parker 50 "Golden Falcon" was produced in the UK and is believed to have been exclusive to the retailer W H Smiths where it was sold as the "Golden Falcon" in the early 80's. Gold filled with a lattice pattern and a cartouche for engraving on this is one of the rarer of the Falcons. However with the slump of Fountain Pen sales by 1983 the pen was discontinued and dropped from production, although they have since become quite sought after by collectors. Another version does exist known as the Parker 50 Secretary which is clipless and has a rounded ball on the end of the cap. This version is extremely rare. 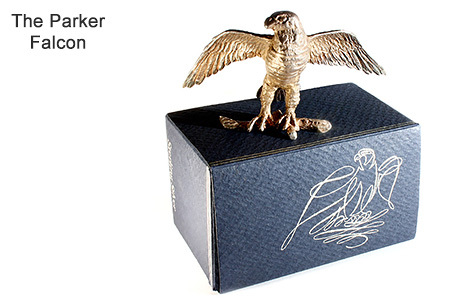 In 1978 Parker ran a competition for pen retailers selling the Parker 50 Falcon and commissioned 100 Stirling Silver Falcon statuettes to be given away as prizes to the winning retailers based on a design by Alex Jardine from the Society Of Wildlife Artists. Made from Stirling Silver, hallmarked, and with only 100 ever made, these little pieces have become highly collectable and an interesting addition to any collection.